Pulstar Spark Plugs from Hiclone will give more power/torque and better fuel efficiency. New spark plug technology, these plugs dramatically increase discharge power by up to 10x, they are so powerful and reliable that they are now used in NASCAR and winning races. 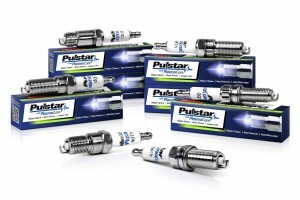 Pulstar Spark Plugs are a radical departure from spark plugs. Their physical dimensions are the same as spark plugs because they have to interface with the engine and ignition system just like spark plugs. But this is where the similarity ends. For over 100 years, ignition technology has been dominated by spark plugs, new technology has changed things! Pulstar Spark Plugs incorporate a pulse circuit, which stores incoming electrical energy from the ignition system and releases the stored energy in a powerful pulse of power. 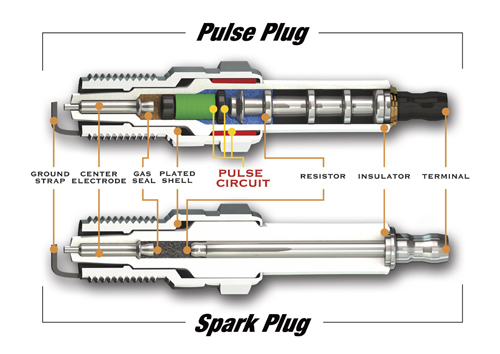 Instead of 50 watts of peak power typical of all spark plugs, pulse plugs deliver up to 1 million watts of peak power. So where does the pulse plug get its incredible power? When the ignition signal is sent to a traditional spark plug, it begins to ionize the spark gap. This means that the voltage builds in the gap until a spark can be formed. During this ionization phase, which lasts about 5 millionths of a second, the incoming voltage (which has nowhere to go) heats up ignition components including the spark plug. This is wasted energy. When the ignition voltage overcomes the resistance in the spark gap, the spark is created with an initial discharge of approximately 50 watts. Once created, the spark resides between the electrodes at very low power for over a period of 30 millionths of a second. 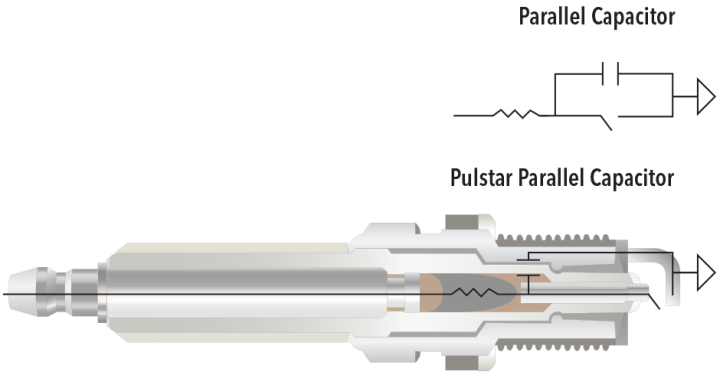 What is different about a Pulstar spark plug is that instead of heating ignition parts during the ionization phase, this energy is stored in the integral circuit inside the pulse plug. When the ignition power overcomes the resistance in the spark gap, the pulse circuit discharges all of its accumulated power – 1 million watts – in 2 billionths of a second! A simple way to think about pulse plugs is that they are similar to a camera flash, whereas spark plugs are more like a flash light. A camera flash is exponentially brighter than a flash light even though they both may use the same battery. Tests at an independent laboratory demonstrate how Pulstar spark plugs burn fuel more efficiently than spark plugs. In this high-speed video (shot at 68,000 frames per second), you can actually see the ignition plume of Pulstar™ growing at more than twice the speed of the spark plug. Pulstar Spark Plugs generates a much larger spark than normal spark plugs, which reduces overall burn time and burns the fuel more completely. Once created, the spark dissipates over a period of 30 millionths of a second. With increased cylinder pressure, the pistons are pushed down with more force, which, in turn, generates more torque in the crankshaft, more liveliness to the throttle and more power to the wheels. See how it works: Electrical energy from the engine’s ignition coil is stored in the built-in capacitor. At the exact moment needed, that energy is released in an amazingly powerful and quick (two nanosecond) high-energy pulse. Pulstar Spark Plugs for a much bigger spark giving you more low down grunt and better Fuel Combustion. Harley VROD: From the very first moment I started the engine, I felt and heard a big difference. Less vibrations and a smoother running engine! Of course, if you don’t use this torque to go faster, the engine does its work with less effort resulting in better fuel efficiency. Another way that Pulstar Spark Plugs improves fuel combustion is by reducing cycle-to-cycle variation. Cycle-to-cycle variation occurs in every engine to some degree and is caused by the dynamics of combustion, load, fuel quality, mixture of air to fuel and many other combustion variables. These variables can cause the spark plug to generate a weak spark and in the worst case, a misfire. This variability in ignition timing robs all spark ignited, internal combustion engines of up to 10% of their efficiency. Buy Hiclone & Pulstar Spark Plugs in Australia: By spinning the air Hiclone gives you a better mixture between the air and fuel, the Pulstar Spark Plugs creates a bigger spark, use both products for even greater result. When ordering we need to know the make, model, year, 2, 4, 6, 8 Cyl. and if possible the model number of the spark plug that are recommended for the vehicle or the one’s your are using, we can then do a cross reference. ** Please Note: Unfortunately, we have no plugs with a 10mm thread as they are being re-designed (posted 4.07.18) unfortunately we cannot give you a date as to when they will be available. About Pulsed Power: Steady accumulation of energy followed by its rapid release can result in the delivery of a larger amount of instantaneous power over a shorter period of time (although the total energy is the same). Energy is typically stored within electrostatic fields (capacitors). By releasing the stored energy over a very short interval (a process that is called energy compression), a huge amount of peak power can be delivered. For example, if one joule of energy is stored within a capacitor and then evenly released over one second, the peak power delivered would only be 1 watt. However, if all of the stored energy were released within one microsecond, the peak power would be one megawatt, a million times greater. To form a spark, a vehicles ignition coil will slowly (relative to the process) inductively increase the voltage delivered to the spark plug until enough voltage is being delivered to allow electricity to bridge the air-fuel mixture between the center electrode and ground strap of the spark plug. This is known as achieving breakdown voltage. 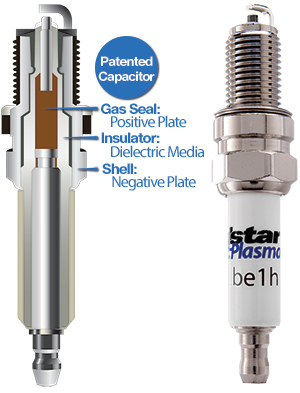 Pulstar Spark Plugs use a patented internal capacitor to store this energy prior to achieving breakdown voltage. When a spark is formed the energy stored in the capacitor is released in a quick and powerful pulse. This pulse is equal to 5,000,000 watts and takes approximately three nanoseconds to complete. The intense converts a portion of the gaseous air-fuel mixture into a highly exited plasma that conditions the fuel mixture to ignite immediately and burn efficiently. Captured by AVL using a process known as Schlieren high-speed photography, this video shows Pulstar’s 5MW pulse followed by the plasma affected fuel mixture burning at an increased rate compared to a conventional spark plug. The capacitor is a component which has the ability or “capacity” to store energy in the form of an electrical charge… In its basic form, a Capacitor consists of two or more parallel conductive (metal) plates which are not connected or touching each other, but are electrically separated either by air or by some form of a good insulating material such as waxed paper, mica, ceramic, plastic or some form of a liquid gel as used in electrolytic capacitors. The insulating layer between a capacitors plates is commonly called the Dielectric. Due to this insulating layer, DC current can not flow through the capacitor as it blocks it allowing instead a voltage to be present across the plates in the form of an electrical charge. The conductive metal plates of a capacitor can be either square, circular or rectangular, or they can be of a cylindrical or spherical shape… When used in a direct current or DC circuit, a capacitor charges up to its supply voltage but blocks the flow of current through it because the dielectric of a capacitor is non-conductive and basically an insulator. A typical capacitor has three parts: a positive plate, a negative plate, and a dielectric media. The positive plate attracts the energy while the negative plate provides it access to ground. The dielectric media allows the negative plate to attract energy but prevents it from crossing between the two plates, forcing the energy to collect and be “stored” on the positive plate. When the energy is released, a quick and powerful pulse of energy is created; delivering a large amount of instantaneous power over a short period of time. Re-purposed by using high-purity, engineered, ceramic. Prevents energy from traveling between the two plates yet allows the shell to act as negative plate. Normal metal shell. Attracts energy to ground. Copper silica gas seal. Stores energy unable to access ground. The capacitor is in parallel with the high voltage circuit, meaning the energy delivered by the ignition coil sees the capacitor and the spark gap simultaneously. While the voltage is ionizing the gap, energy is flowing into the capacitor (charging the capacitor). The resistance across the gap is infinite (open circuit) while the resistance in the capacitor is less than infinite. A resistance reversal takes place when ionization occurs and the spark is formed, the resistance in the gap becomes less than the resistance in the capacitor. The gap acts as a switch, automatically triggering the capacitor. At which point whatever energy is stored in the capacitor (3-10mJ) discharges into the combustion chamber creating the plasma-forming pulse. DO NOT DROP! Installing a pulse plug that has been accidentally dropped could result in poor driving performance and engine damage. GAP. Set the gap to whats recommended for your vehicle, the maximum allowable gap of 0.055″ for standard vehicles, set to 0.025″ for turbo, supercharged vehicles and LPG engines, if unsure please call me on 1800 683 466 for further information. Tighten BE1 and DG1 plugs to 20 Ft-Lbs. Tighten AD1, CB1 and EF1 plugs to 11 Ft-Lbs. (In the absence of a torque wrench, a general rule of thumb is to torque tapered seat plugs (AD1, CB1 and EF1) 1/8th turn past hand tight and torque flat seat plugs (BE1 and DG1) 1/4th turn past hand tight. On most computer controlled vehicles allow at least one tank of petrol for the computer to learn the characteristics of the new pulse plugs. You can speed up the learning process by disconnecting the negative battery terminal during install. Remember to reconnect the terminal before attempting to start the engine. If you have an on-board fuel economy computer, you may want to reset it during installation of your pulse plugs. Give the computer several tanks to settle into an average fuel economy reading. Use a little Dielectric grease on the inside of the rubber boot covering the plugs, do not put any on to metal parts apart from a little on the plug thread as you’ll not be taking them out any time soon. When installing make sure the socket in nice and straight when tightening the plug. Q: What is a pulse plug? A: A new ignition device that replaces spark plugs and increases peak spark current by up to 10 times as compared to spark plugs. Q: How long does Pulstar™ last? A: Pulstar™ lasts as long as most spark plugs - about 150,000 km depending on the condition of your vehicle and driving habits. Q: How much performance improvement will I get after the installation of Pulstar™ in my car? A: Pulstar™ will improve all aspects of combustion quality in your car. 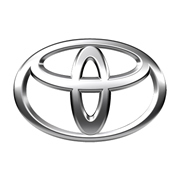 You will notice improved throttle responsiveness, more torque and better fuel economy. The amount of performance will depend on the make, model and condition of your vehicle. In general, you should expect torque to increase by 4 to 12% and realize a significant improvement in fuel economy. Q: Do I need to make any modifications to my car to use Pulstar™? A: No. Pulstar™ is a "plug and play" product with no further modifications necessary. Q: Will the high power of Pulstar™ in any way harm my engine? A: No. The high power of Pulstar™ occurs within 2 nanoseconds (billionths of a second), which is enough time to ignite fuel, but not enough time to overheat the combustion chamber or engine parts.